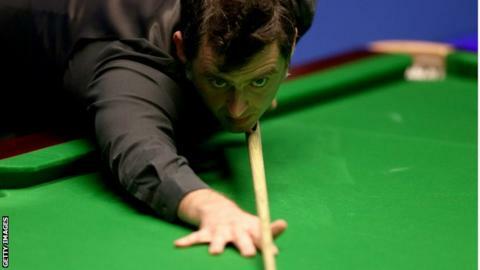 Ronnie O'Sullivan let a spectator who evaded security and ran around the table take his last shot as he won in the third round at the English Open. The woman entered the playing arena at the Barnsley Metrodome as five-time world champion O'Sullivan was about to seal a 4-1 win over China's Zhang Yong. He carried on playing to pot the pink ball - leaving him on a 129 break - then handed his cue to the spectator. She had two attempts at sinking the black before being led away. "I really wanted her to pot it," O'Sullivan said. "I thought when the [security] guys came out they were going to rugby tackle her, but I thought, 'If you do that, you might kill her.'" "I saved her from getting a rugby tackle," he told Eurosport. O'Sullivan, who has been given permission to play in trainers after injuring an ankle, beat John Higgins 4-3 in the fourth round later on Thursday. Elsewhere, world number 55 Jack Lisowski beat number-four ranked Judd Trump 4-3 in the fourth round after defeating two-time world champion Mark Williams 4-2 in the third. Reigning world champion Mark Selby lost 4-1 to Xiao Guodong of China. Welshman Michael White reached the quarter-finals by beating Thailand's James Wattana 4-3. White will face Switzerland's Alexander Ursenbacher, who beat Shaun Murphy 4-1, in the last eight on Friday.